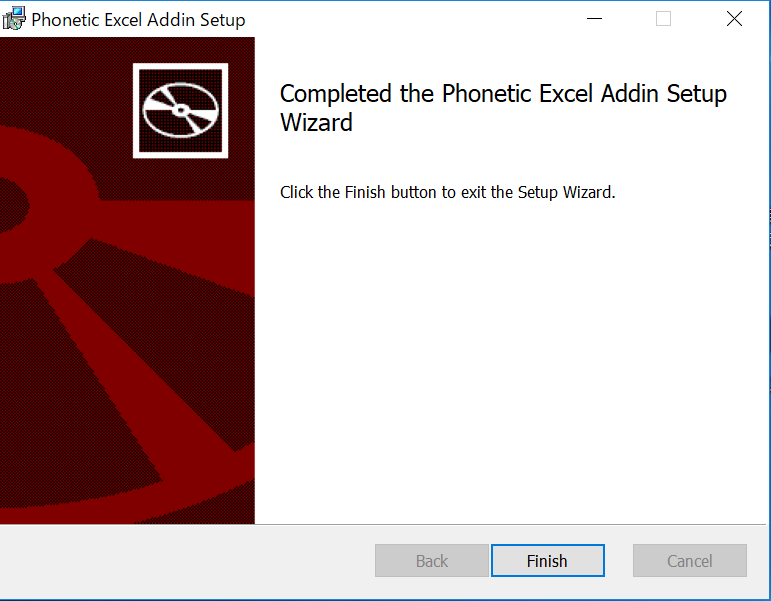 Input Phonetic Alphabet (also IPA) very easily by this Word, Excel, PowerPoint addin – Free! 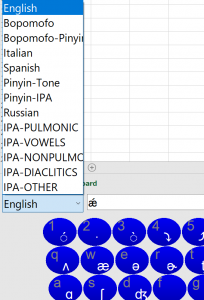 At this post, Introduce screen keyboard addin “Phonetic Addin” for phonetic alphabet, IPA inputting easily.You can also analyze unicode by another panel. 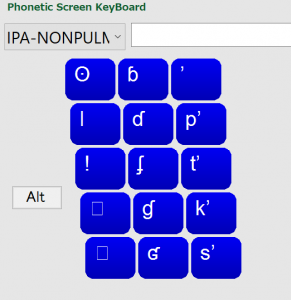 6.1 Phonetic Keyboard for each languages. 6.2.0.1 How to change table type and keyboard type. Easy to input IPA in Word, Excel, PowerPoint. 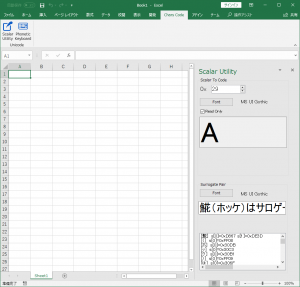 Easy to Analyze Unicode characters in Word, Excel, PowerPoint. Good for learning pronunciation for languages. All installers are in .zip download from below. Please translate bellow statement by machine. Now i cann’t translate them all. IPA keyboard is CC BY-SA from IPA Full Chart. Please use this software like MIT Lisence. Unzip .zip. and click your favorite version. Push “Finish” button and close this installation panel. Version up is checked and OK under my enviroment. But If don’t go well, once do uninstall older version and install. Easily input English, Chinese-Pinyin, Rusinan, Spanish, Italian, Bopomo phonetic alphabet. 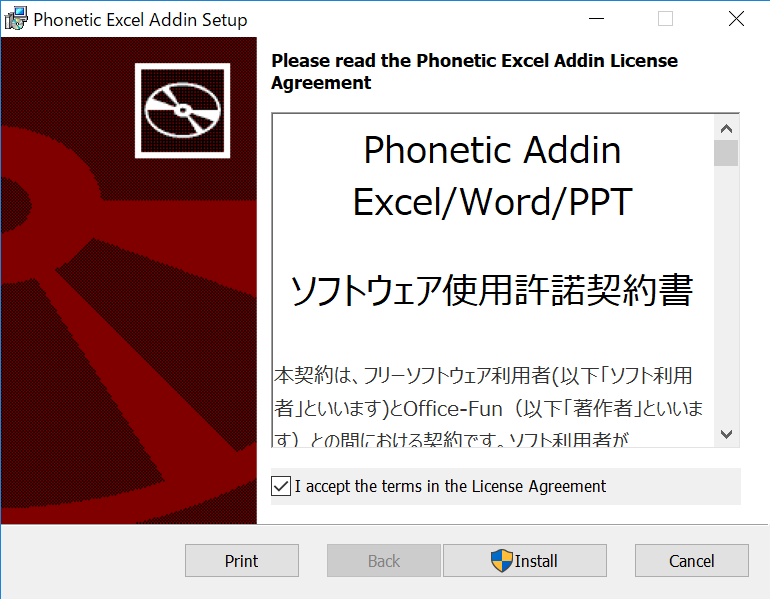 Word, Excel, PowerPoint have same UI. * IPA is International Phoneteic Alphabet. 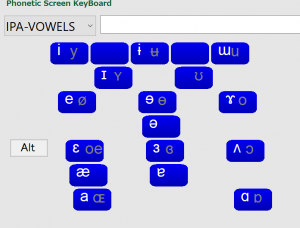 Phonetic Keyboard for each languages. When English is selected, most used phonetic keys in English is arranged like keyboard. 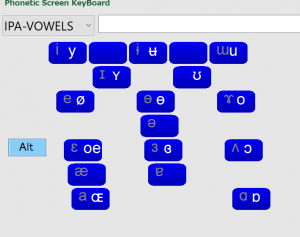 Click Alt, phonetic characters are highlighted with Alt key on. Click key, input highlighted chars. You can also input accent character. 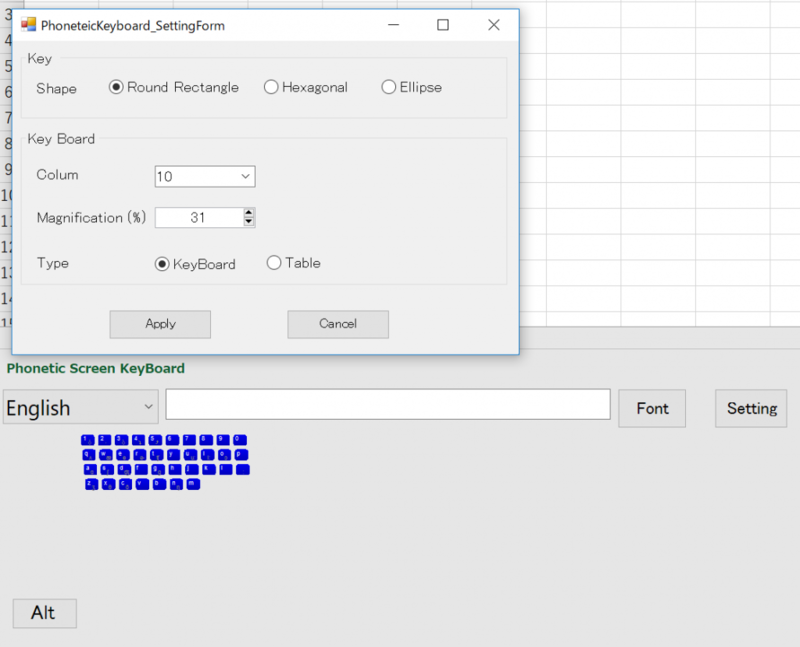 Copy inputted chars in text box and Paste to other cell or documents. Please click “Setting” button, and Chamge Shape to Hexagonal, and push “Apply” button. By “Font” button, Change the input text box’s font. 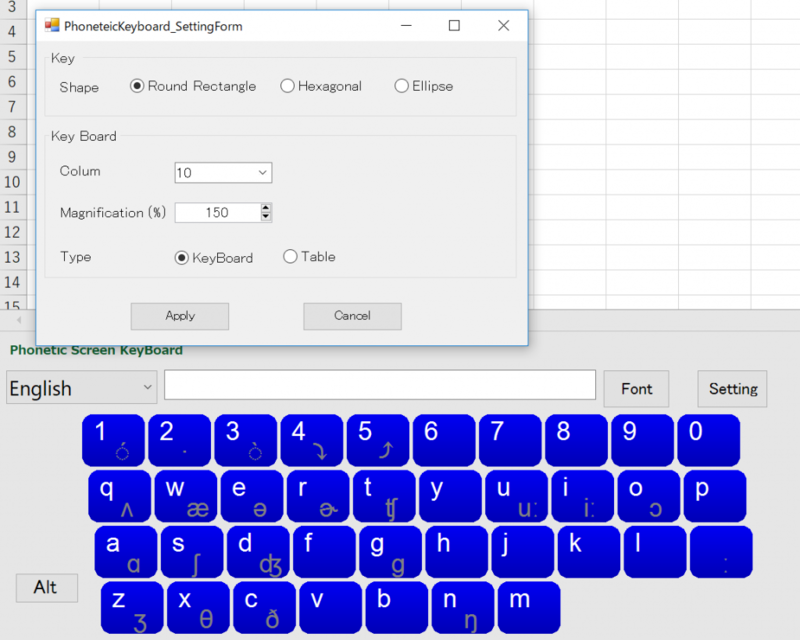 All Full IPA Chart’s characters can be inputted by this screen keyboard. 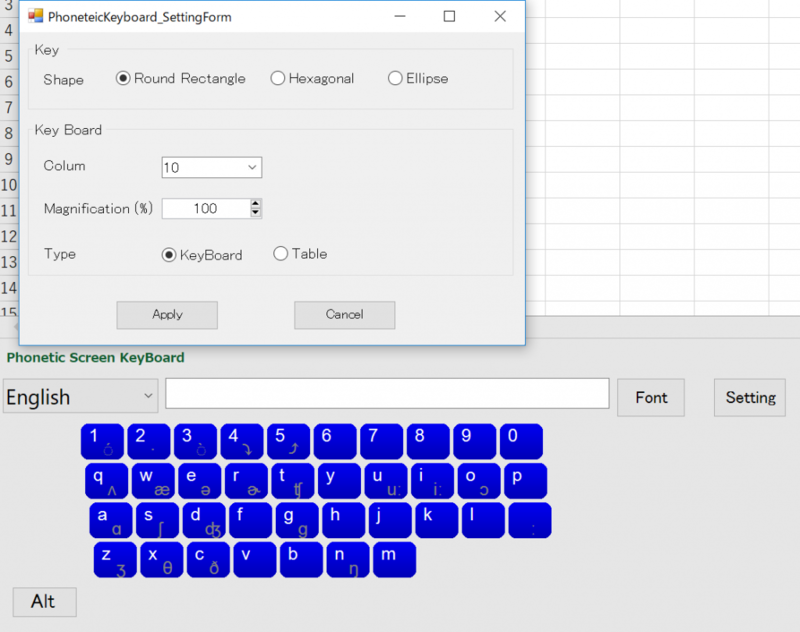 some keys are not show in keyboard, but input text box can be shown normally when correct font is chosen. 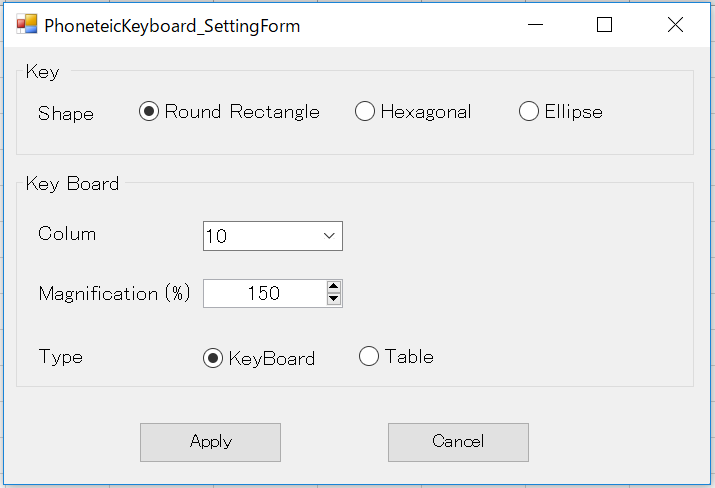 How to change table type and keyboard type. Open Setting panel, Select “Table” → Click Apply. Especially, IPA-PULMONIC,IPA-NONPUMONIC, etc is easy to look by selecting table type. 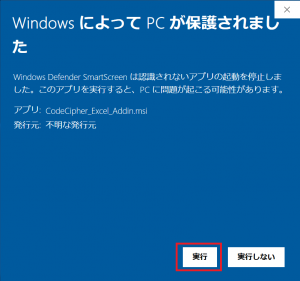 I developed this addins by old DELL PC, and installed this addin to Win on Mac. Screen Keys were very small in Win on Mac. 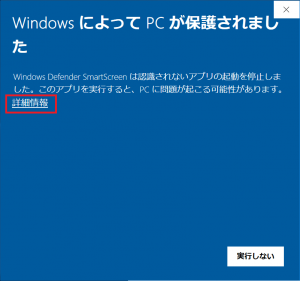 Because, i think monitor’s DPI are different by each PC. I fixed this malfunction. Please change this magnification on your monitor. 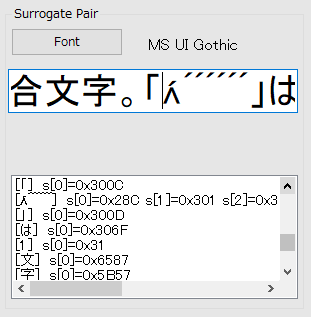 Some of Unicode characters are not show because font doesn’t implement these codes. Refer to this post. 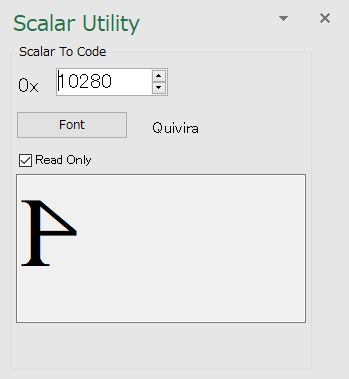 Scalar Utility function show this relation between font and scalar ( Unicode character value). Shown this panel in right side. In Upper Side, An Unicode character is shown by your setting scalar value. 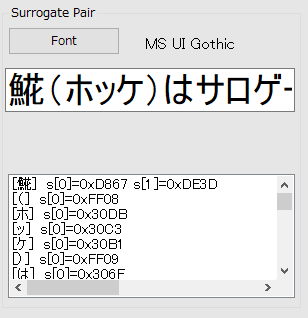 In Lower side, you can analyze surrogate pair and combining character. Paste strings and characters, Analyze them. In 2011, I learned English and Chinese(Taiwaniese), understand the importance of pronauntiation. and I had dissatifacion to input IPA characters in PC. I wanted to have an easy way to input IPA, concieved the screen keyboards like this and implemented proto-type in that time. I knew relations between unicode and fonts a little. Fonts were not enhanced and implemented. There were many thing to think and I didn’t have the place of release and degree of completion was low. These things made me not to release IPA screen keyboard, and bothered me, at last I forget these things. Now, I know VSTO (office addin developing tool) and my skill has been glowing up. I have the place for realse. I reacall this keyboard when I research relations between unicode(New ver) and font. I can easily implement this keyboard to Office by VSTO and release it at v 1.0.0.0 for Japan. This keyboard is not perfect but it’s useful for IPA and pronauntiation study. I update it Ver 1.1.0.0.